Home / Blog / Deciphering Corporate Actions: What are Corporate Actions, The Types of Corporate Actions and Dividends? For those who would like to know where to access companies' corporate actions and how to decipher deadlines such as Ex-Date, Record Date and Date Payable, please refer to the previous post. Dividends are distributions from a portion of the company's earnings to the shareholders in the form of cash or shares. It can be viewed as a form of reward for the shareholders' trust in the company. Beware: For companies who are performing poorly, they may still declare dividends that are taken from the company's working capital. Thus, it is important not to assume that all companies that distribute dividends are stable with consistent earnings. The board of directors may choose to issue dividends quarterly, bi-annually or annually. Special Dividends can be declared occasionally together with a scheduled dividend or separately. In simple terms, special dividends are given on a one-off basis due to stellar earnings or divestment of assets etc. In a nutshell, companies can do the following with their net profits. Let's take a look at one example. If you have trouble understanding what does Ex-Date, Record Date, Date Payable means, please refer to the previous post. From the picture above, here are the lessons you can learn. Singtel declares dividends bi-annually - so kindly highlighted by yours truly in the picture. This translates to Singtel shareholders receiving S$0.205 for every Singtel share that they own in 2017. 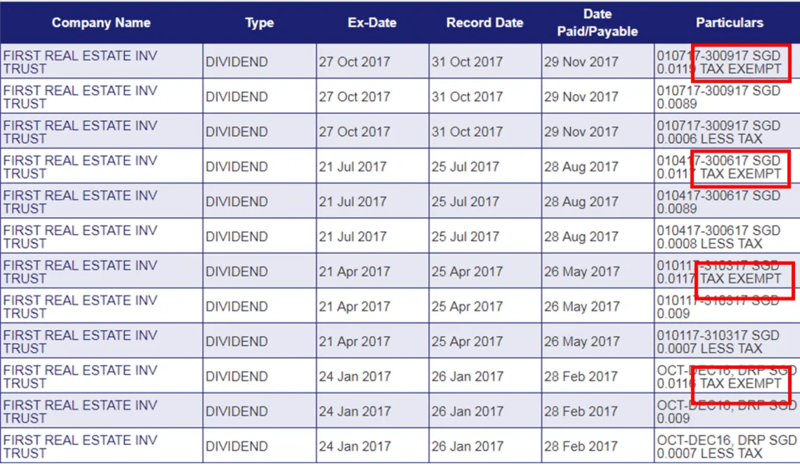 If I were to own 5,000 shares of Singtel, I would have received S$1,025 (5,000 shares x S$0.205) in dividends in year 2017. If we were to use the same example above, we have the following information. With the assumption that revenue and dividends remain consistent, the calculation can be done with the current share price. The rationale is for potential investors to assess whether the dividend yield based on current pricing, is worth the investment. For Singapore listed companies, we are not taxed for dividends at the individual capacity. However, foreign dividends received in Singapore are taxable. One- Tier Tax: Dividends are taxed at the corporation level. Less Tax: Companies that generate from multiple revenue sources not based in Singapore are taxed overseas as well. The dividend amount indicated are already less of tax. Important Note: The dividends declared by listed companies in Singapore are net of all taxes. You receive what you see. There are many individuals who are new to investing who will try to exploit dividend corporate actions using the following format. If Company A has a share price of $1.00, declares $0.30 dividends and has an Ex-Date on 1st February. Investor buys Company A shares on 31st Jan.
Investor sells Company A shares on 1st Feb.
Investor gets free dividends of $0.30. Voila~! Free money of $0.30 per share! The stock market is based on supply and demand, potential investors are savvy to prevent buying a $0.30 premium on the Ex-Date. On the Ex-Date, the share price of Company A will theoretically drop by $0.30 to $0.70, after taking into account of the dividends distributed. Hence, if the share price of Company A is above $0.70 on 1st February, the investor would have made a capital gain. If the share price of Company A falls more than $0.70 on 1st February, the investor would like made a capital loss, even after taking account of the dividends the investor will be receiving. How to view the amount of dividends received, calculate dividend yield and the different taxation tiers. Why you can't get a Free Lunch from dividend corporate actions.